The Vickers Class "S" 40 mm gun was developed in the late 1930s as an aircraft weapon. The ammunition was based on the 40x158R cartridge case of the naval 2 pdr AA gun. The weapon was a long-recoil design derived from the 37 mm 1½pdr C.O.W. gun.The gun was originally intended as a bomber defensive weapon and was tested as such in a turret fitted to a modified Vickers Wellington II. This was not adopted for service, but when the need to attack tanks from the air was identified the "S" gun was chosen and special AP ammunition developed. Two underwing guns were fitted to Hawker Hurricane IID fighters which were issued to No.6 Squadron, RAF. They served in North Africa from mid-1942 where they achieved considerable success; claims included 144 tanks hit, of which 47 were destroyed, plus nearly 200 other vehicles. However, they suffered heavy losses, mainly to ground fire (the Hurricanes were poorly protected) and also lacked effectiveness against the Tiger tank. In 1944 the aircraft served in the Far East, mainly firing HE ammunition against road and river transport. Tests in the Far East showed a high level of accuracy, with an average of 25% of shots fired at tanks striking the target. Attacks with HE were twice as accurate as with AP, possibly because the ballistics were a closer match with the .303" Brownings used for sighting (the HE shell was lighter and was fired at a higher velocity). By comparison, the practice strike rate of the 60 pdr RPs (rocket projectiles) fired by fighter-bombers was only 5% against tank-sized targets. Operational Research following the Normandy battles of 1944 revealed that in action this fell to only 0.5%, presumably because of problems in making the complex mental calculations about the trajectory of the slow-accelerating rockets, although the effect of a salvo of RPs on the morale of tank crews was admittedly considerable. Class "S" Mk. 1 gun details are as follows: Weight: 134 kg. Length: 297 cm. Barrel length: 170 cm. Rate of Fire: 100 rpm. Magazine capacity: 15 round drum. The Czech designer Janacek (which translates as "little John") was working on squeezebore weapons and ammunition in the late 1930s. The principle was similar to the Gerlich taper bore, but achieved by adding an adaptor to the muzzle of an existing gun, rather than by using a specially-made tapered barrel. Work continued in Britain during the war, leading to the adoption of the "Littlejohn adaptor" for the 2 pdr tank/anti-tank gun (40x304R) and the associated flanged projectiles, designed to be squeezed down from 40mm to around 30mm. 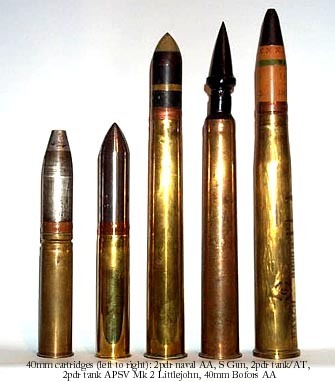 The lightweight projectiles, known as APSV (armour piercing super velocity) were fired at very high velocities, resulting in a considerable increase in armour penetration. Two marks were issued, the Mk 2 projectile being longer and heavier because of the addition of nose and ballistic caps. The 2 pdr Littlejohn saw service in armoured cars and light tanks. Various other weapons were tried with Littlejohn adaptors and ammunition, including the 37 mm gun used in the American "Locust" light tank. However, it has only recently been rediscovered that a Littlejohn "S" gun was also tested. The Public Record Office in Kew, London, contains a report (ref: AVIA/8/857), illustrated with photographs of the gun and ammunition. This concerns air tests in May 1944 of a Hurricane IID with a Littlejohn adaptor fitted to an "S" gun, and some modifications to the breech to deal with the different projectiles. The test was not favourable as the gun/ammunition combination did not function with sufficient reliability, and no further records have been found. The armour penetration can also be estimated. The 2 pdr APCBC shot was credited with penetrating 53 mm at 450 m at a 30 degree angle of impact (from the vertical). This improved to 88 mm with the APSV Mk I shot, and presumably rather more with the Mk 2. The 2½ lb AP shot first used in the "S" gun could penetrate 47 mm / 360 m /30 degrees, the later 3 lb shot improving this by 9%. These figures appear surprisingly high, given the low muzzle velocity, until it is remembered that the velocity of the firing aircraft must be added to that of the shot. In the case of a 240 mph attack speed, this amounts to 107 m/s. In practice, "S" gun penetration was probably even better than this, as the usual firing distance was about 150 m. Judging by all of this it seems likely that the Littlejohn "S" gun would have been capable of penetrating about 80mm, sufficient to be effective against the side or rear armour of virtually any tank of the period. The Littlejohn "S" gun trials were an interesting experiment but in practice came too late to stand much chance of service acceptance, even if the tests had been successful. The RPs which replaced the "S" gun may have been much less accurate but they were more versatile. Also, once RPs had been fired the fighter-bombers which carried them were free to fight their way out of trouble without the considerable penalties of weight, aerodynamic drag and an armament unsuitable for air fighting, which so handicapped the Hurricane IID. 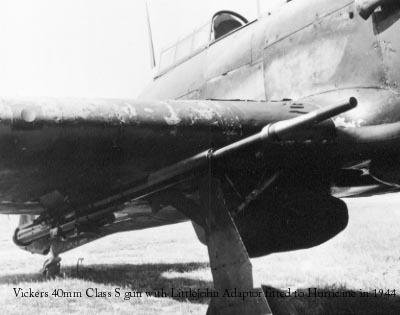 This would have been less of a problem if the Hurricane’s Merlin engine installation had been designed to accept an engine-mounted gun firing through the propeller hub, as with the Yak-9T, as this would have halved the weight penalty and virtually eliminated the aerodynamic drag. With the benefit of hindsight, it is surprising that a loading with an "arrowhead" or APCR (armour-piercing, composite, rigid) lightweight, tungsten-cored, full-calibre projectile was not developed for the "S" gun earlier in the war. This would have easier to develop than the Littlejohn system, and the main drawback of APCR - the aerodynamic drag acting on the light, full-calibre projectile - would not have mattered at the very short firing distance used by the Hurricane IID. It is possible that some such experiments did take place, as there is an unexplained gap in the mark numbers between the 2½ lb Mk.I shot and the 3 lb Mk.VI. Incidentally, the same effect could have been achieved by firing the Littlejohn ammunition without the adaptor being fitted. Some armoured car crews reportedly did just that, so that they could rapidly switch to firing full-calibre HE shells instead of AP shot without having to leave the vehicle to unscrew the Littlejohn adaptor - not always convenient or healthy! Finally, the estimated performance of the Littlejohn "S" gun makes an interesting comparison with the loading for the modern 30mm GAU-8/A rotary cannon used in the American A-10 "tankbuster". This fires a 425 g API projectile at 988 m/s, for a muzzle energy of 207,000 j. Had the "S" gun used the APSV Mk 1 projectile, the ballistic performance would probably have been remarkably similar, albeit at a rate of 2 rounds per second instead of 70! Thanks are due to Tim Mason, whose book "The Secret Years: Flight Testing at Boscombe Down 1939-45" (Hikoki, 1998) contains the Littlejohn "S" gun photograph which first sparked this enquiry, and who subsequently pointed the way to the source material, to Helen McCartney who located the air test document, and to Dr Ian Gooderson, author of "Air Power at the Battlefront: Allied Close Air Support in Europe 1943-45" (Frank Cass, 1998) who provided comparative information on the effectiveness of the "S" gun and RPs. Information on the Hurricane IID's service record was also drawn from "Aggressors: Tank Buster vs. Combat Vehicle" by Alex Vanags-Baginskis (Airlife, 1990).